With intense global competition, many of today’s product companies struggle to set themselves apart from their competition. 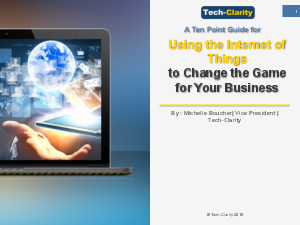 The Internet of Things (IoT) offers exciting options for innovation through new business models and services that create new revenue opportunities. Companies that successfully take advantage of this disruption have a chance to create a competitive advantage and bound ahead of their competition. The challenge is knowing where to start. Businesses may even need to rethink their business aspirations and how they create revenue. To be successful, businesses must consider how they transform their business model, the infrastructure they need, and the impact on engineering. Tech-Clarity offers the following ten tips to help companies transform their business to take advantage of this opportunity and prepare for growth and profitability.